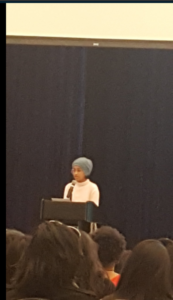 On 18th March 2017, I was fortunate to have attended the Empowering Women of Color Conference (EWOCC) at Berkeley. This event was organized by The Women of Color Initiative, a project of the UC Berkeley Graduate Assembly. 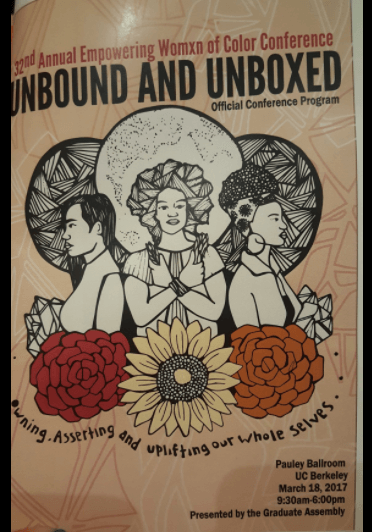 This year’s theme was “Unbound and Unboxed”, with a focus on the urgent need for collective care, nurturing, and affirmation for women of color, who lead the battles against social injustice and cycles of violence and oppression. 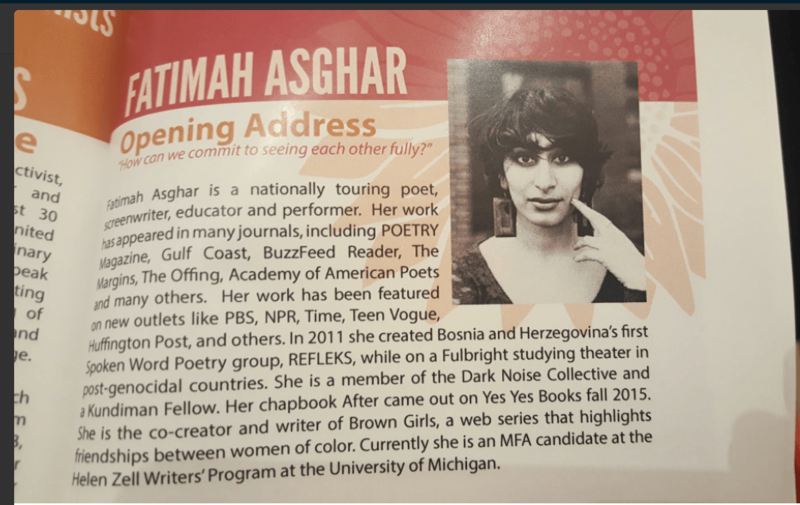 The moment I walked in the event space, I could feel the energy, dedication and enthusiasm by the student activists and organizers who made this conference possible and successful. The conference began with Wakan Wiya Opening Blessings. This beautiful ceremony was performed by Zamora, a Two Spirit ceremonial drummer and singer along with other drummers from the larger Two Spirit prayer community, the Bay Area American Indian Two Spirit (BAAITS) Drum. Mesmerized by the powerful beats of the drumming ceremony, the morning program continued to be inspiring! karen kaur dhillon, the plenary youth speaker for the conference is a committed advocate dedicated to addressing and transforming institutionalized oppression in the education system through law and policy. As one of the many immigrant students who had dealt with barriers and intersectional forms of oppression, and witnessing how it also affected her peers (students of color), karen kaur talked about what it was like growing up to be an immigrant and her experiences in the education system and other forms of oppression. Having witnessed the same passion, commitment and excitement at the recent ThisGEN Youth Summit through social media, I was deeply moved by karen’s stories and commitment and the evolving role of youth-led movement building and activism. What does solidarity & allyship mean for women of color? How can we commit to seeing each other fully? 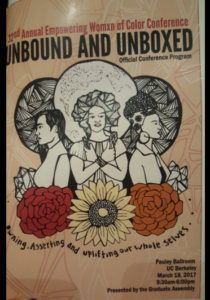 The conference workshops not only examined the daily lived experiences of women of color, such as biases and micro-aggressions but also explored other intersectional topics ranging from challenging transphobia, reproductive justice, body and identity politics, de-colonialization of harmful practices, to state and gender violence against Native American women and immigrant communities. In each of the two sessions, there were about 18-20 workshops that we could choose from to participate, which proved to be a dilemma due to the fascinating and challenging topics being addressed. In the first session, I participated in the ‘Challenging Transphobia’ workshop by Abeni Jones, a black trans educator, workshop facilitator, artist, and writer in New Orleans, LA. Using this workshop as a brave space to grow and learn and be challenged, Abeni inroduced Trans/Gender 101 definitions, provided everyday examples and helped us understand how prejudice (for example, gender essentialism) leads to oppression (transphobia) and how can we prevent and challenge it. The second session was more about Self-Care. This interactive and engaging workshop titled “Radical Self-Care is Not Optional” was led by Nakia Dillard, a life coach and workshop facilitator who guides women for self-care and personal development. We spoke about why we hesitate to take care and prioritize our well-being first and what are the barriers to self-care. This helped us discuss our own experiences of what self-care means and using examples of her own such as journaling, hobbies, and other coping methods– Nakia encouraged us to write affirmations for ourselves, list of things for self-care and identify things we are grateful for in our lives. 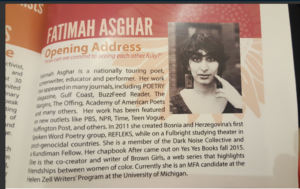 As a South Asian immigrant woman who is actively involved in this movement against social injustice and gender-violence, what struck me the most in this conference was the intersectional nature and commonness of discrimination, barriers, violence, and other forms of oppression that women of color encounter everyday. More importantly, I realized the urgent need for identifying root causes and risk factors that lead to unsafe, violent, and hostile spaces for women of color to prevent it from happening. To prevent and end the cycle of oppression, trauma, injustice and violence, it is critical we first find spaces of well-being and identify ways of replenishing our strength, preservation, and resistance.